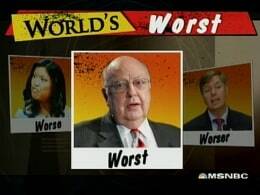 Oct. 15: Roger Ailes said on the debut of the Fox Business Channel, “... some of the cable networks, such as MSNBC, have their opinion people actually anchor the news. We don't do that. We have the separation of church and state."